Being one of the favored names of the field, we are engaged in presenting Polypropylene PP Cap Sealing Machine that is obtainable at economical rates. Proposed assemblage is manufactured in accordance with the preset industry standards. Due to the rugged construction, longer service life and minimum maintenance, these efficient machines are vastly demanded. Known for manufacturing and exporting a broad range of supreme quality Pharmaceutical Machines, "Create Industries", was set up in the year 1987. By using sophisticated machinery based on cutting-edge technology, our professionals manufacture these pharmaceutical machines in adherence to the industry laid standards. 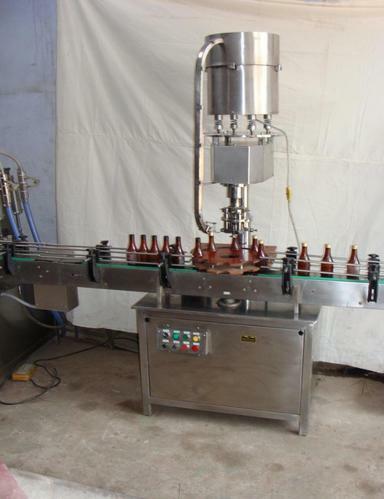 Owing to their high performance, low power consumption, sturdy construction and longer operational life, these pharmaceutical machines are highly demanded in the market. In conformity with the specifications and requirements provided by the customers, these pharmaceutical machines can be custom design. The machine range offered by us is inclusive of Tablet Machines, Industrial Machinery and Filling Machine. Moreover, we have engaged in offering excellent Consultancy Service in Tablet and Capsule Section in Pharmaceutical and Herbal Project. Owing to their effectiveness, these services are highly demanded in the market. It is owing to our ability to manage bulk orders of the pharmaceutical machines within the promised time frame that we have been able to cater to huge clientele across the world. Some of our most reliable and trusted customers are Nuclios Pharmaceutical Private Limited, Ras Sharm Pharma Private Limited and VI Exports.